New tornado warnings: Why National Weather Service storm alerts weren’t scary enough. TORNADO POSSIBLE. MIGHT KILL YOU … MIGHT NOT. Why aren’t National Weather Service storm warnings scary enough? A mesocyclone tornado, a violently rotating column of air that descends from a thunderstorm. 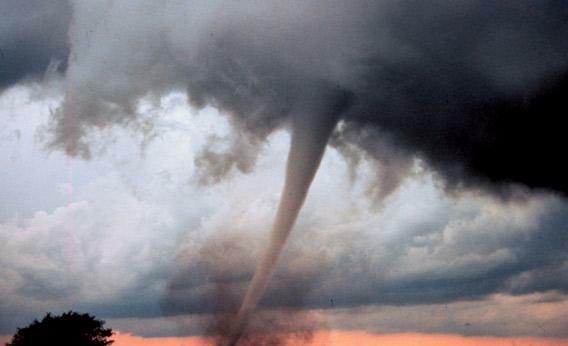 The most violent tornadoes are capable of tremendous destruction with wind speeds of 250 mph or more. The National Weather Service on Monday began testing new, scarier storm warnings in Kansas and Missouri, two of the most tornado-prone states. The messages beamed to news outlets now might say a tornado will cause “mass devastation” or “complete destruction” or that a particularly foreboding twister is “not survivable.” Why weren’t the old warnings scary enough? Because they all sounded the same. Until now, storm warnings were short on details and didn’t clearly distinguish between run-of-the-mill gusts and deadly tornadoes. Before 1950, the Weather Bureau (as it was then called) refused to make tornado predictions at all, fearing that they would incite panic. It remained reticent to issue warnings long after that, partly because tornado prediction was a tricky business: The only way to know for sure that one was coming was for someone to spot a funnel cloud. At such a point, an official tornado report had to be taken seriously—especially since the news might be broadcast only minutes before the twister hit. Sometimes the twister hit first. The tornado warning system hasn’t changed much since it began in the 1950s—a time when meteorologists sat in darkened rooms, using cathode ray tubes and grease pencils to piece together images of storms based on radar data. Stronger radar echoes indicated where rain was really heavy, but there was no reliable way to remotely sense storm-system rotation or high wind speeds—the tell-tale signs of a tornado. The biggest technological breakthrough came in the 1990s, as Doppler radar made it possible to detect not only the contours of a storm, but also wind directions and velocities inside the storm. Those data allow meteorologists to see how a storm system is rotating, making it easier to predict tornadoes before they actually form or touch down. These days, the average lead time for a tornado warning is about 12 minutes. The twister that killed 160 people in Joplin, Mo., last year came with 20 minutes’ advance notice. Many other jarring aspects of the warnings reflect the National Weather Service’s long-held methods, from their screeching tones and garbled computer voices to the use of all capital letters in written dispatches. Until the 1980s, the reports were transmitted to news outlets via teleprinters—basically, typewriters hooked up to phone lines. Early teletype systems required all capital letters and prohibited many forms of punctuation (the NWS uses ellipses instead of commas), and the weather service has stuck to that format ever since. One reason is that it remains the standard of the Geneva-based World Meteorological Organization, partly to accommodate a few countries that still rely on old-fashioned technologies. In recent years, the NWS has begun experimenting with a new report format that includes such innovations as lowercase letters and all kinds of punctuation marks. The synthesized voice that broadcasts information on weather radios and the alert tones that precede emergency broadcasts date from the late 1990s. Until then, the alert tone was a steady analog shriek that served only to notify broadcasters and listeners of an incoming message (though in some cases, it was “only a test”). Since 1997, it has been a set of digital bursts—that nails-on-a-chalkboard noise—containing actual weather information that displays on broadcasters’ receiving equipment. The automated voice debuted a year later, allowing weather radio to provide updates in near-real time. Before that, the information was recorded by humans, who could only update the information for one locale at a time. The original electronic voice, described charitably by one meteorologist as “sounding a bit like Arnold Schwarzenegger,” has undergone tweaks for clarity over the years. It’s designed to pronounce words phonetically for maximum flexibility rather than being preprogrammed to speak certain phrases or word combinations, which is why it can’t match the smoothness of voices such as the iPhone’s Siri. Explainer thanks Mike Hudson of the National Weather Service and Greg Forbes of The Weather Channel.